Have you got a bookmaker account with a different currency than the rest of your accounts? RebelBetting now supports assigning different currencies to all bookmakers, and will handle conversions and calculations automatically for you! This feature allows you to place your multi-currency bets much faster. Our servers automatically collects up-to-date currency rates from the European Central Bank. The only thing you need to do is to set your bookmaker currency, and the software takes care of everything else! First, set your Default Currency by going to Options -> User. The arb profit will always be presented in your Default Currency. This means that you will still easily see that the arb profit is balanced on every outcome. USD is the Default Currency in the screenshot above. As you can see, the bookmaker in Bet 2 has the currency EUR, but the arb profit (and total stake) is still shown as USD. Where can I configure a bookmakers currency? You can set this by going to Options -> Bookmaker Setup. Below, PaddyPower is set to use Euro as account currency. The bookmaker currency is also displayed in the Betting Browser. 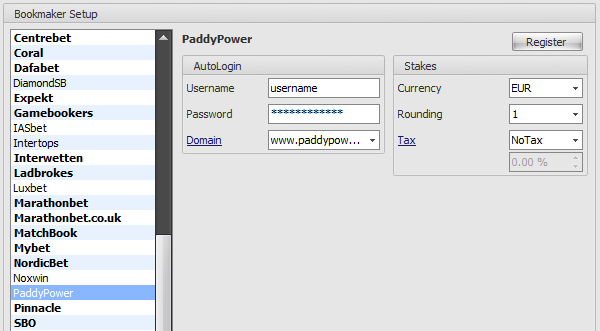 Below is a screenshot of an arb at Paddy Power, with EUR as currency (but with USD as Default Currency). PLEASE NOTE! To avoid any currency exchange fees, you should strive to have all your accounts (bookmakers and E-wallets) in the same currency. The most common currencies are USD, EUR or GBP. You should choose ONE, and stick to that currency for the rest of your arbitrage career. There are however bookmakers that only accepts one currency, and it might not be the same currency as you have on your other accounts. This is when our Multiple Currency feature is valuable.